What should you see in Dubai? This itinerary for Dubai is here to help. 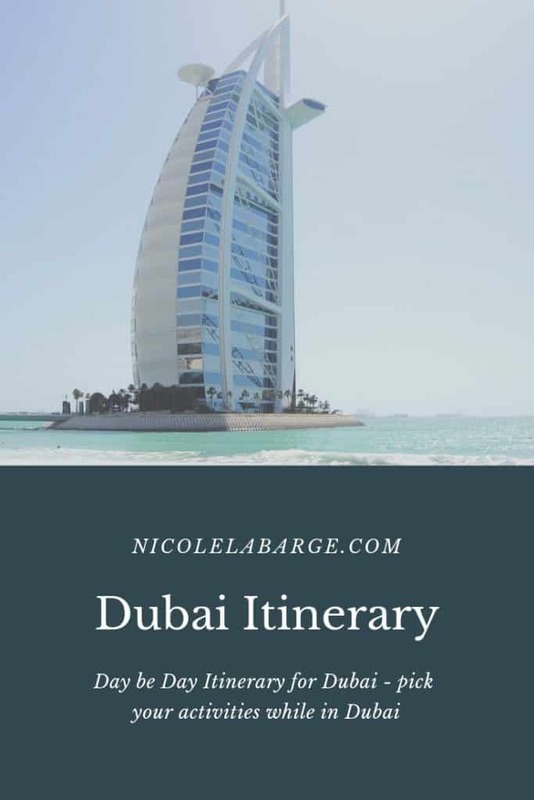 Whether you have one day in Dubai or a week in Dubai – here are all the top sites to see in this itinerary to Dubai. 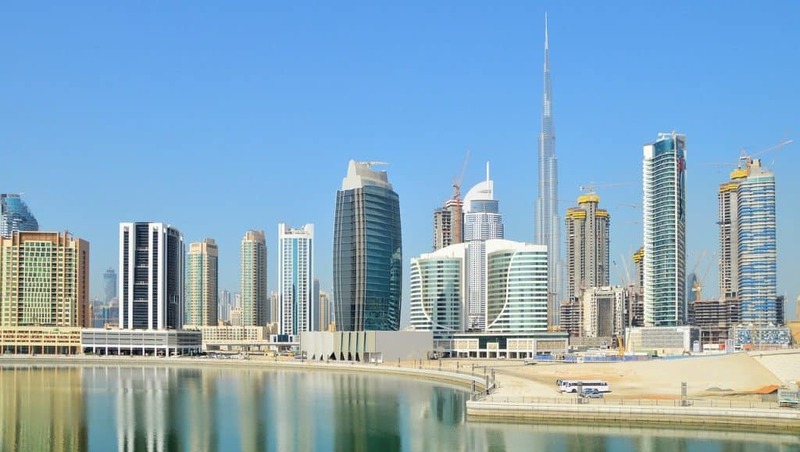 There are many highlights to Dubai that we will cover in this itinerary – The Palm Jumeirah, the Dubai Marina, The Burj Khalifa, Mall of the Emirates, Big Bus Dubai, Dubai Garden Glow, Dubai Aquarium and underwater zoo, and so much more. Let’s get started on this Itinerary for Dubai. I found the hotel perfectly located for exploring the city and overlooking the water and also the largest ferris wheel in the world – Ain Dubai Observation Wheel. My room was extremely spacious and comfortable but the best thing was the view of the water. One practical thing to note about getting around in Dubai. Yes, Uber does work here but I used the local app Careem – Car Booking App. It is cheaper than Uber if you use the basic car function. Funny story – I used it the first night I arrived at the airport and the app let me know that I was being picked up in a Lexus (with the license plate number and driver name same as Uber). I thought wow that’s nice I’ll be picked up in a Lexus. The driver came into the airport with a sign with my name on it and gave me a bottle of water when I got to the car. I thought wow this is service! I was booking one of the higher levels of cars haha. I was sad the next day when a Honda Odyssey picked me up. Careem is affordable but thing to remember out Dubai is that the distances are far. My car from the airport to Amwaj Rotana Jumeirah Beach Residence costs $153 AED which is about $41 USD. I also took a trip from my hotel to the Dubai Mall and that cost $83 AED which is about $22 USD. Remember when you are planning your days is to plan to do all the activities in the area before moving onto the next. You can also use the Metro but again you will spend a bit of time moving from one area to another. This itinerary to Dubai is planned to cover off each area in one day. I wrote out the days in the order of importance in Dubai. If you only have a day, the Day 1 itinerary hits all of the tourist spots. The Dubai Mall is the biggest mall in the Emirates although it is not my favorite. If you are looking to just go shopping I would recommend the Mall of the Emirates as there is more to do there and a large food court. 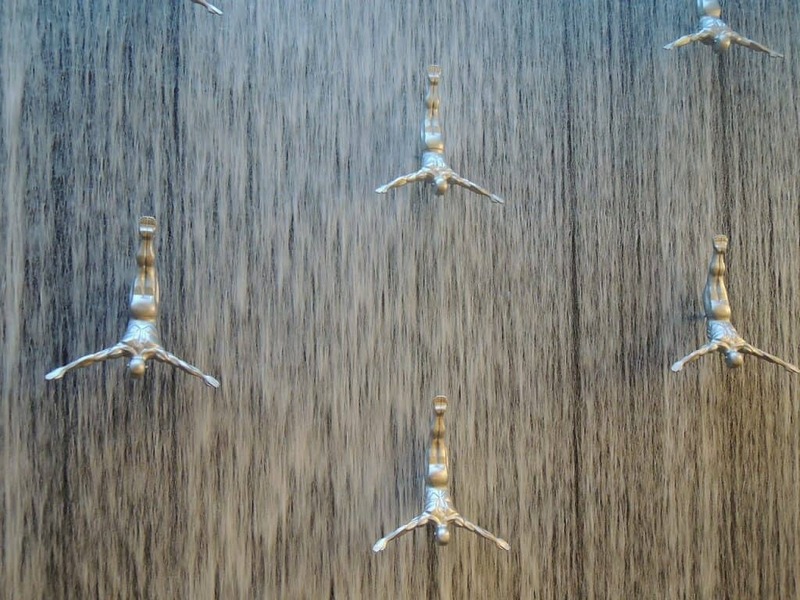 But the Dubai Mall is definitely worth a visit even if you are not into shopping. Yes, you can walk around the luxury lane or stop at any of the cafes there. I recommend visiting the Aquarium downstairs inside the mall. 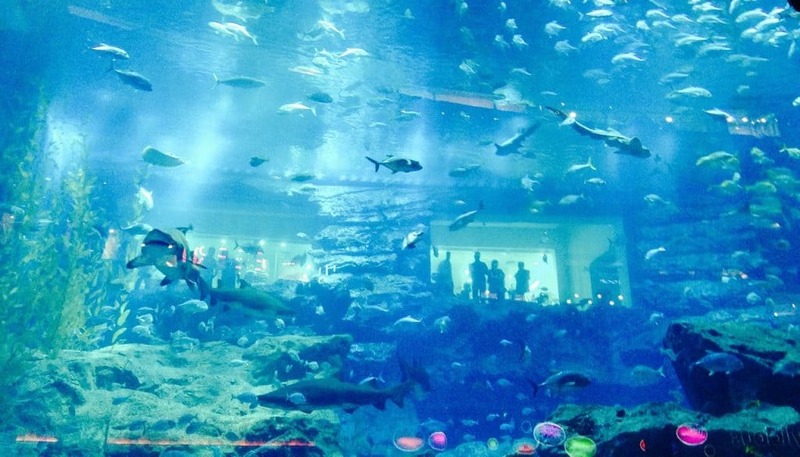 Part of the Dubai Aquarium is on show in the centre of the mall if you do not want to pay the 195 AED to go in. It is worth it to go into the aquarium as the 10-million litre Dubai Aquarium tank, located on the Ground Level of The Dubai Mall, is the largest suspended aquariums in the world. 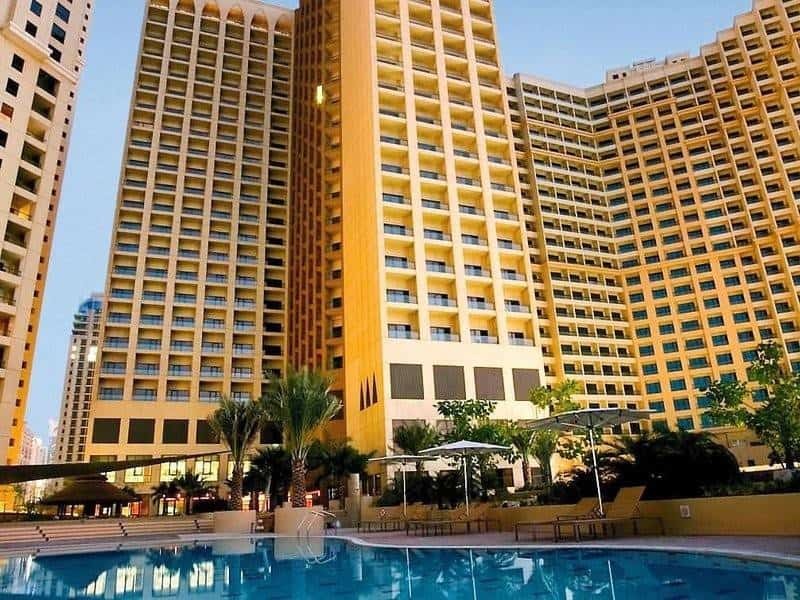 The Explorer Experience is 195 AED but if you book online you receive 25% off making it 145 AED. There are many other encounters and experiences you can book as well depending on what you are interested in. I spent three hours at the mall. I had a bit of shopping to do but I also checked out the aquarium and the water fountain in the mall before stopping for an ice coffee to take it all in. There are lots of restaurants in the mall too. I recommend downloading the Dubai Mall app. Yes, the mall really has its own app! 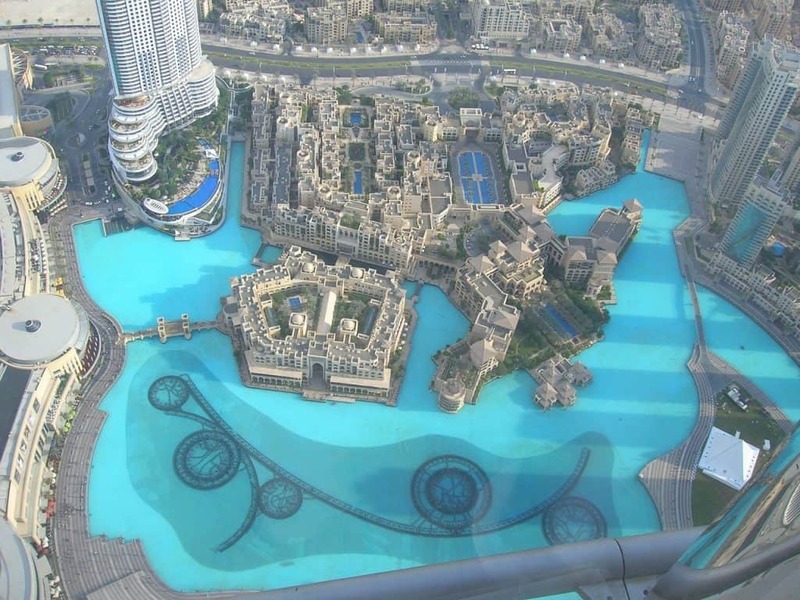 Next, head to the Dubai Fountains. They are the tallest performing water fountains at over 900 ft tall. They are on daily at 1pm and 1.30pm. The best time to see the fountains is at night when they light up as well but if you only have a day they are worth seeing. Actually you can see the fountains from the Mall as well if you visit during the summer or its too hot outside. 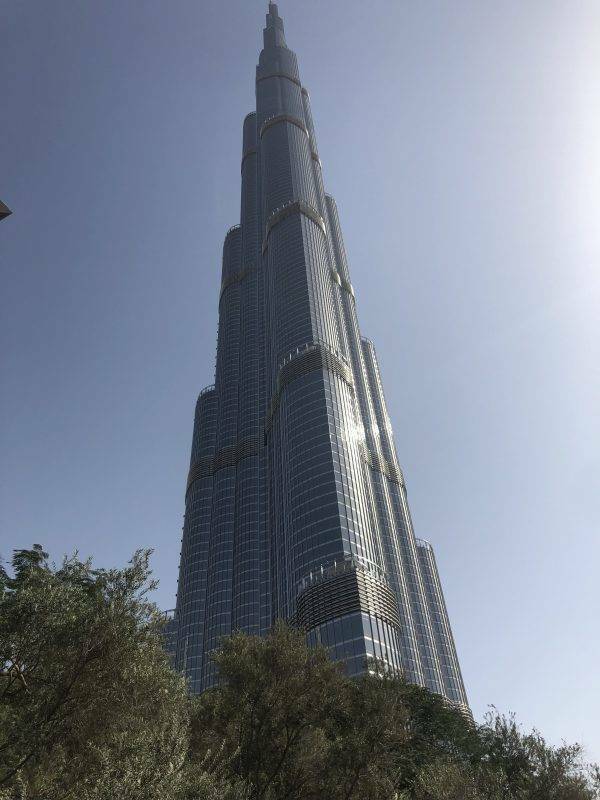 About a 15 minute walk from the Mall is the Burj Khalifa. Tickets to the Top Level 125 Floor are $125 AED or you can go to the Sky Level Floor 148 for $350 AED. I chose to have high tea at the At.mosphere restaurant for $515 AED. That was the price for a window seat and afternoon tea. I arrived at 2pm and was finished around 4pm. I think the best part of the restaurant was going to the bathroom! The views from there were just incredible as well and you walk in and think wow! 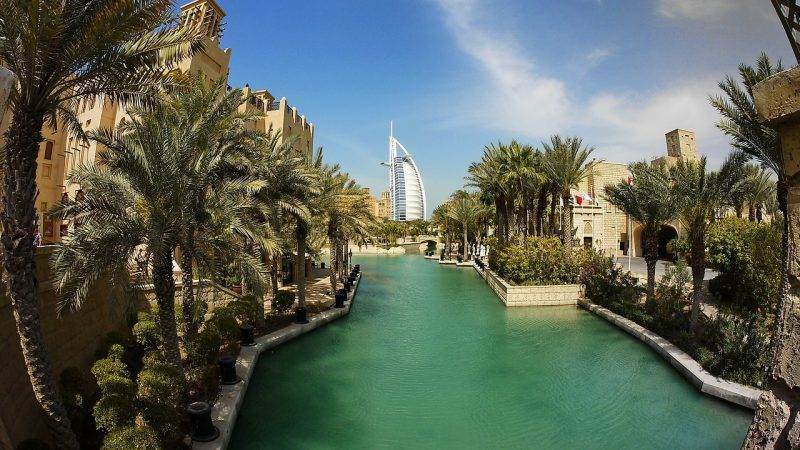 The Souk Madinat is located near the Dubai Mall and worth a visit as well. Souk Madinat combines traditional Middle Eastern shopping culture of stands, barrows and stalls with a mix of shops, restaurants, gold jewellery and souvenir shops. I stumbled on one of the restaurants here called Tortuga, a Mexican restaurant. I love Mexican food and this place did not disappoint. One thing I would say about food in Dubai is that it is quite expensive. I thought it would be cheaper than the US. I spent $50 for lunch at PF Changs at the Mall of the Emirates. I couldn’t help myself as I was craving beef broccoli and it had to be done. All I ordered was a soda, spring rolls and beef broccoli. Not worth $50 in my opinion but I did decide to eat at an American chain. 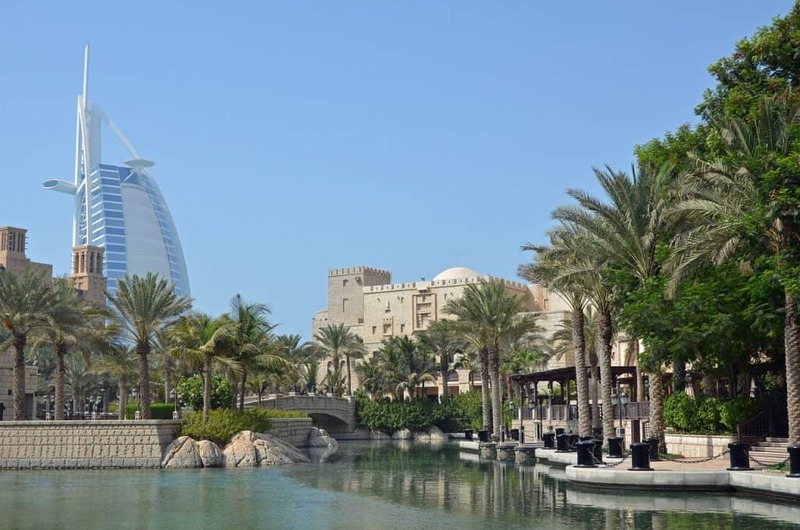 The Jumeirah area of Dubai is where the local emirates live in Dubai and is one of the few walkable areas in Dubai. Kite Beach is the best beach in Dubai and you will see many water sports in this area such as kite surfing and jet skiing. 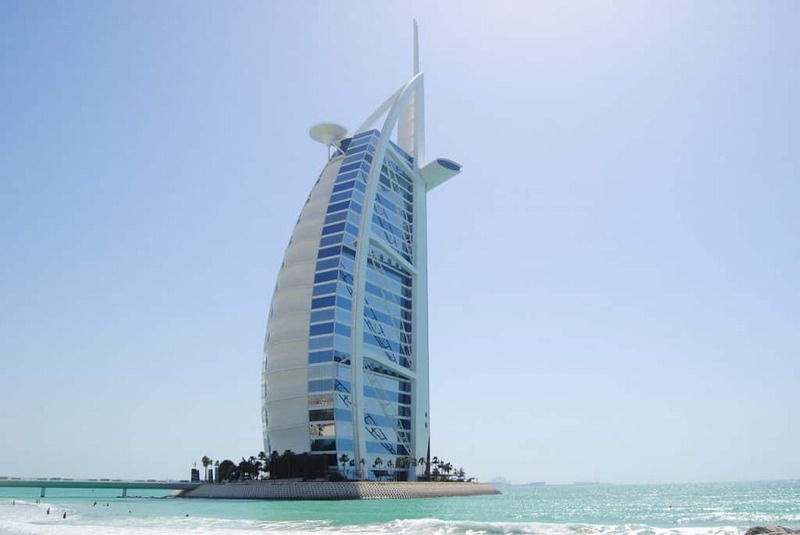 It is a long pristine stretch of beach here with great views of the Burj Al Arab – the only 7 star hotel in Dubai. It is very busy on a Friday and Saturday and the weather in Dubai makes it a great time to go year round. You can also visit the Jumeirah Mosque which is open to tourists. They have an open doors, open minds policy and welcomes all visitors who want to learn about Islam. You can even take a tour and photos are welcomed. 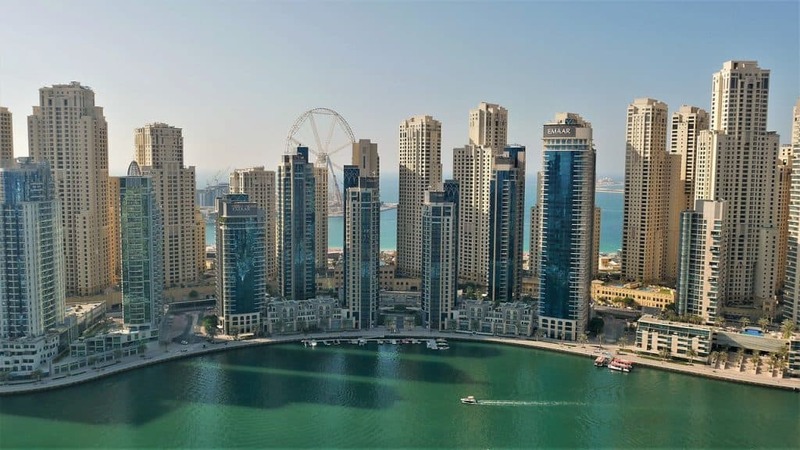 Dubai Marina is a great place to walk around, take a boat cruise, have a drink at a 5 star hotel or dinner at a local place. 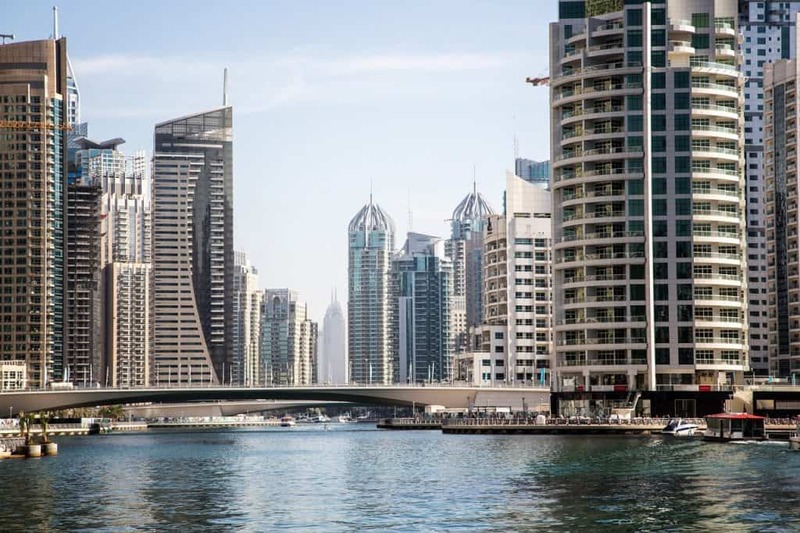 You can check out the Dubai Marina website for more information. Do know that you should dress modestly while in Dubai. This shouldn’t be a problem as long as you use common sense. Also, you are not able to drink alcohol outside of 4 and 5 star hotels in Dubai and it is expensive as well. Wanted a way to take a break from the heat but still see as much as possible in Dubai? I recommend taking the Hop on Hop off Bus in Dubai. The bus covers a lot of ground and as mentioned before Dubai is quite spread out. Welcome to the city that has it all. Hop on our Dubai bus tour to experience a true fusion of traditional Arabian charm and futuristic dynamism. Enjoy panoramic views of Dubai’s dramatic skyline, perfect sandy beaches and the world’s tallest building. Hop off to explore historical souks, forts and palaces, and enjoy ultra-chic dining and ambient nightlife. With Big Bus Dubai, you’ll taste it all. The buses even have free wifi on board so you can research where to explore when you hop off. Tickets start at $67USD to $95USD and they are cheaper to buy online. You can also take the bus to Old Dubai and walk around the souq there. This is one of the most interesting areas of Dubai and you will find a lot of activities there like the Dubai Museum or the Spice Souk. You will enjoy exploring this area. There are several things you could do on your trip to Dubai such as take a day trip to Abu Dhabi. Buses leave every 20 minutes from Dubai to Abu Dhabi. Head out to the desert. You could take a day trip to the desert to camp under the stars or ride camels over the dunes. There are lots of 4×4 tours of the desert. There is so much to do in Dubai. Check out this guide to 50 Things to do in Dubai. Or go more in depth with this Guide to Dubai. You are sure to have a great time there. Why use Careem or Uber? Taxis are plentiful in Dubai, clean and about half the price! The metro would have also been an economical alternative getting from the marina to the Dubai mall – around 15 dhs max. Also you mention Dubai souks, but don’t mention the creek area. A highlight is getting an abra from the Dubai side of the creek to the deira side where the spice souk is located. Also missed mentioning Bastikiya old city area on the Dubai side. There’s so much more than malls! There is definitely so much more than malls and while I was there I barely scratched the surface. I cannot wait to return to Dubai and explore more. I’m hoping to be back there in September and will check out old city and the creek area. I think for a first timer I was just doing touristy things. Agree about expensive food. I’ve spent two 18hr+ layovers in Dubai. My first layover I made it out to the Burj khalifa and the Dubai Mall. My nearly sole purpose for the visit to the mall was to meet penguins at Ski Dubai. There is a penguin habitat under the ski slopes and they say they work with scientists on conservation efforts. I met a Gentoo penguin and two Emperor penguins. My 2nd layover I went to the desert and had an amazing time, this was an 18hr layover. We did dune busting, camel visits, watched dancing including fire dancing and had a buffet. I have never been to Dubai but it sure looks like it is not just Burj Khalifa and Malls. I would love to visit Jumeirah and old souq; Jumeirah looks so pretty!! Didn’t know Dubai was so expensive, I knew Burj Khalifa was expensive but thought that was it; hop on hop off bus for 90 dollars is crazy! Yes, 90AED though is $25USD so that’s about on par. It is such a pretty city. Wow, Dubai looks fabulous! I didn’t realize it’s so beautiful. No wonder everybody travels there lately. I’d love to take a 4 x 4 tour of the desert. You shared some very useful information about Dubai here, so I’ll bookmark your post for later. Good to know that Uber does work there. I’ve never heard about Careem, their local app. I’ll make a note of that too. Great list of things to do for first time visitors. I’m quite surprised as well at how expensive the place is. I’d love to go 4×4 in the desert as well as check out some of the malls. I get the sense that a long weekend is plenty of time. Thanks for the tips. I loved this as I was just in Dubai last yer and did half of the excursions you listed…other half too hot to do. Maybe next visit! My favourite part of Dubai is JBR, where you stayed. You are right taking a taxi in Dubai is quite pricy, that is why whenever I go there I rent a car. The petrol is cheap and it is easier to go around. Its been quite a few years since we visited Dubai and I believe a lot has changed since then. 3 days seems good to explore the city. I would like to spend time exploring old Dubai and its forts. You have shared very useful information and I’m sure it’ll come handy when I plan a trip there. Also good to know that Uber works there too. Bus service isn’t that good there. Lovely itinerary for Dubai. You seem to have covered the key attractions of Dubai in three days. For places outside Dubai, highly recommend Fujeirah and Khor Fakkan along with Al Ain. These are quite different from the regular cities. Amazing post keep remarkable all the most conventional. Dubai is the capital of U.A.E (United . Arab. Emirates ) . Dubai is the so Mind – blowing in the world. Dubai is the so UNESCO heritage in the world. I’m so interest in phosphorescent of the concrete happenings that I have a doublets twosome or several or couple .